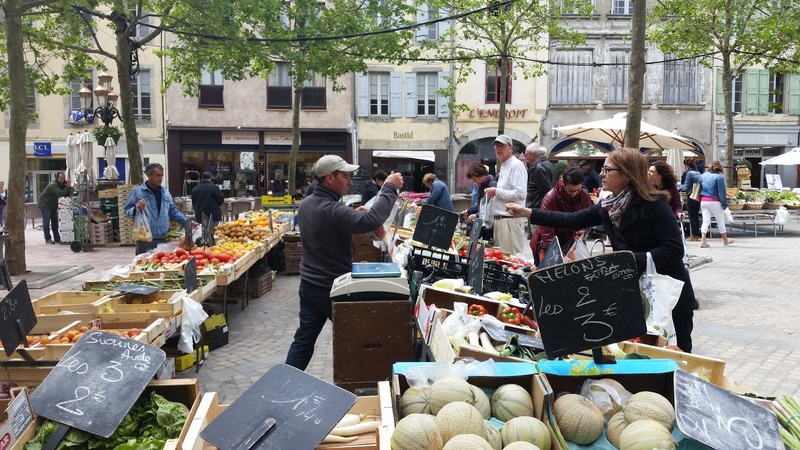 For months, My husband, Eric and I dreamed about our trip to Europe and then specifically, to France. We originally were thinking of going to Greece, based upon the recommendations from a lot of fellow travelers, but the struggling economy there scared us off for this trip. Instead we settled on southern France. This was a big deal for us. We have four adult children and after thirty years of marriage, we felt like we really deserved to splurge on ourselves, but like most folks, our finances were limited. 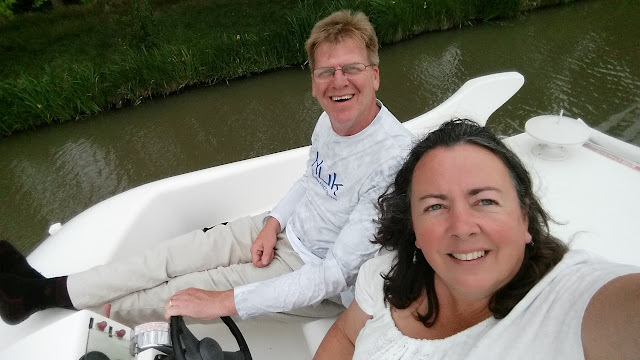 We settled on renting a boat that would take us along a section of the Canal du Midi. The pictures on their website were breathtaking and although we did not speak any French, we felt this was a way to enjoy the area without having to do a ton of dialog. 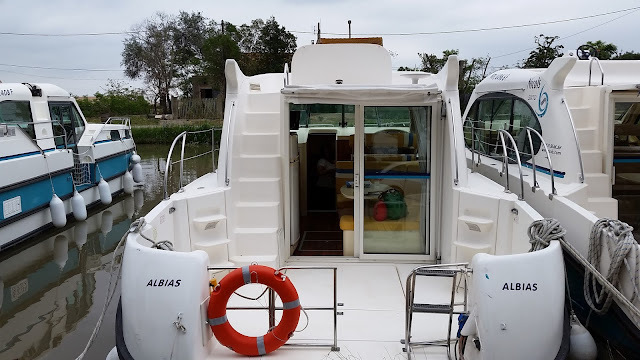 After shopping around for a few weeks, we chose a company, Nicols, to hire the boat from as they seemed to have the newest models and lots of good reviews. Thankfully, they had a broker who worked out of Florida to help us work out all the details. I got creative and scratched together all the credit card points I could get my hands on and was able to get flights to Germany with just points, saving us a lot of money. 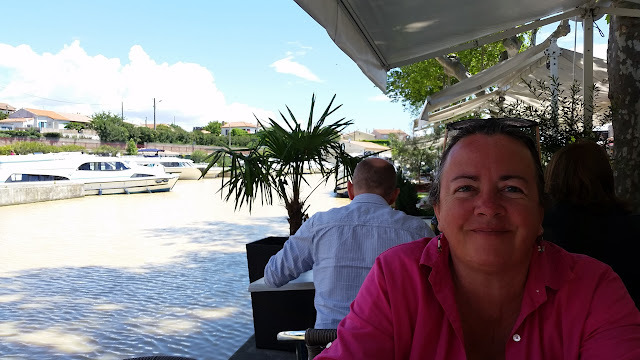 Slowly, we chose each section of travel to get to the port in the south of France, just north of the Mediterranean Sea. We booked trains, shuttles, buses and taxis and a hotel room. Most of the businesses did not have much of an internet presence, but we figured it out. The day finally came and we headed to the airport. Of course, our flight was delayed, but we were not concerned and we made it out only a couple of hours later. We hoped to be able to sleep as it was an overnight flight, but a screaming baby kept us all awake right up until our landing. Flexibility and patience is a very important part of traveling! Our flight attendants were kind and wine and beer was free so we all managed. 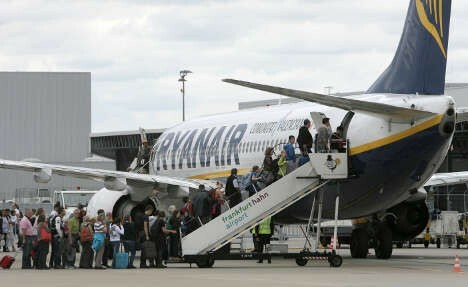 Ryan Air was our next stop, but we had almost ten hours to kill. We wandered around the airport in Frankfurt, took our shuttle and hung around the airport in Kirchberg. We couldn't find a comfortable place to chill so we actually found a nice grassy spot outside and napped with our luggage for an hour or so. 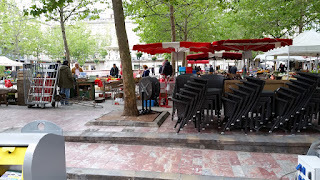 Then we checked out the curry sausage stand - rather interesting; then the beer spot - pretty decent but no variety; the empty upstairs until finally, we were in line to board our flight to Montpellier! A fast moving storm blew in and all we could hear was the noise of the water on the corrugated metal roofing, or at least we thought it was water. Come to find out, it was a mix of rain and hail. So much hail that there were piles of it along the runway. The rain was intense and as we waited we saw firemen rushing about dropping boards across the bases of the doors to stop the inflow of flood waters. We were all hustled to another higher part of the airport and got off the ground before the next round of rain started. 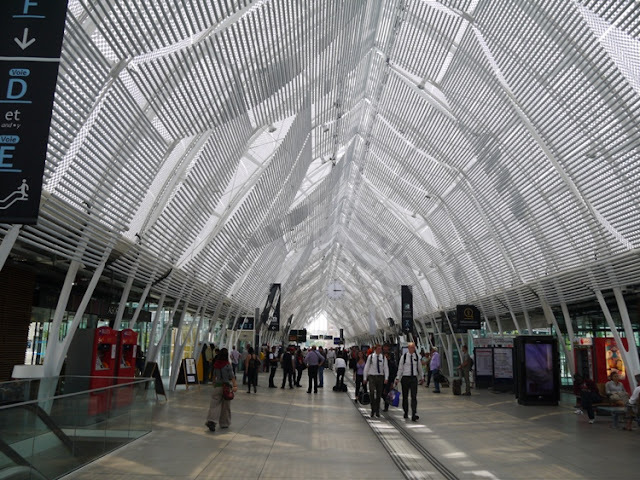 Montpellier was dark when we arrived but we found our way to the shuttles that would take us to our hotel, the Citadine. The streets were well lit, but almost no people were to be seen. Thankfully, we found our hotel just a short distance away even though our phone had spotty coverage. The concierge greeted us in French but quickly changed to speak to us in pretty clear English. We were surprised that more people didn't speak English but we managed. Our room was a shock when we walked in to find a couch and a bathroom. A fold-out couch? Thankfully, it was really the best fold out we had ever encountered and although we could not locate any place to get a bite for dinner, we slept quite peacefully after a hot shower. Our alarms went off from our newly charged phones (we didn't forget to bring our inverter and plug converter) all too early, but we had a train to catch. 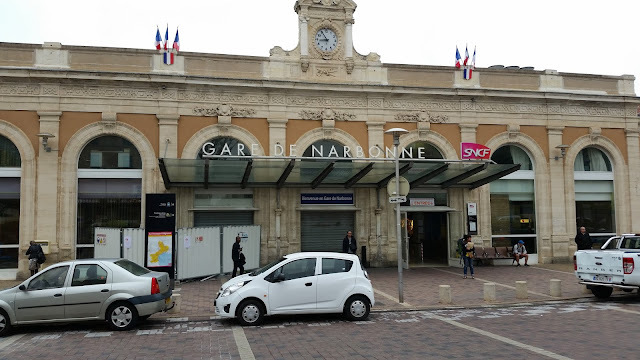 After finding some French coffee in the lobby, we set off on foot to find the train station, listed as being about half a mile away. There were several folks about, some seemingly on their way to work and others just enjoying the cool morning air. After one correction from a gentleman, we found the steel and glass dome-shaped station. We struggled to understand which platform or how to get our tickets, but one of the managers spoke some English and helped us get tickets and we figured out which platform to get on just in the nick of time. 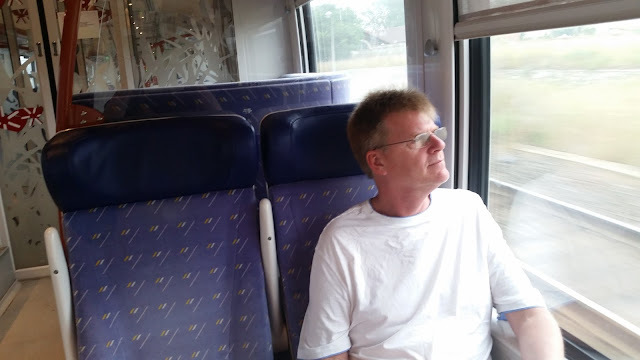 Eric enjoying the comfortable train ride through southern France. The trains in France are wonderful. They are clean, cost efficient and punctual. There were electrical outlets for charging our phones and we could easily get up and walk around. Riding across the countryside, we watched the terrain go from very Spanish looking clay homes in an arid landscape with olive trees and yucca plants to vineyards and more lush gardens. 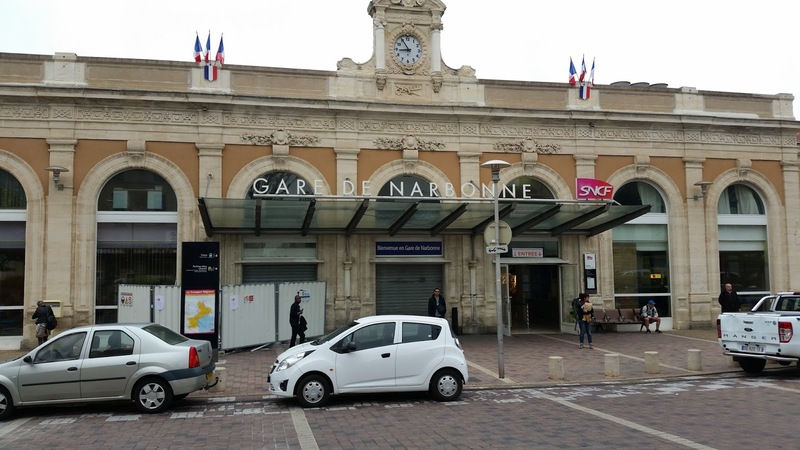 The train took us about 90 minutes to get to Narbonne - almost to our destination. 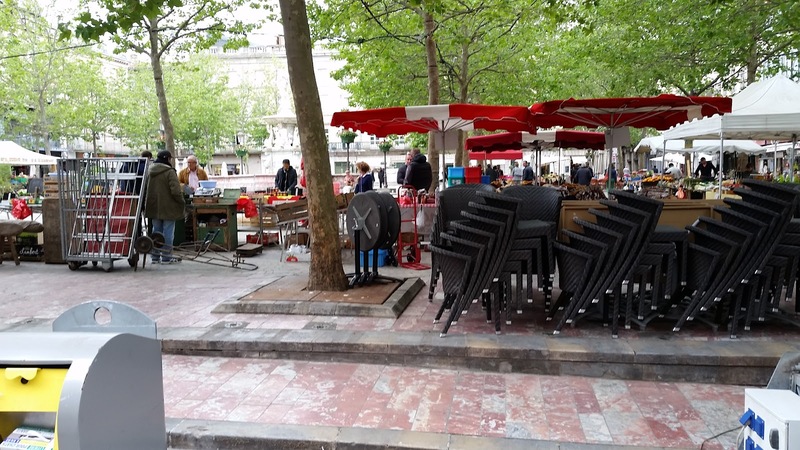 The area was much busier than Montpellier and we decided to check out the town for some lunch. We found a little cafe and the menu had English translations. Of course, they served wine with lunch. I ordered a tuna sandwich and was surprised and delighted to find they made it without mayonnaise, just lettuce, tomatoes and onion in a baguette. After a tiny cup of espresso, we headed out to check out the Les Halles de Narbonne, an indoor market of many vendors recommended to us by our travel broker. Talk about phenomenal products! 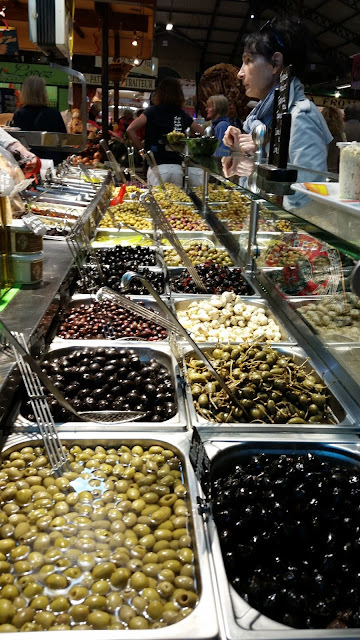 So many cheeses, olives, fruit and vegetables, fish and meats, breads and candy! 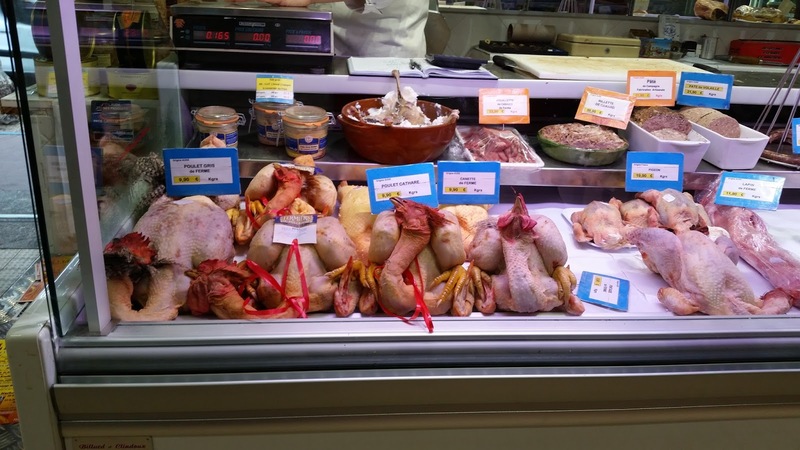 We feasted with our eyes on the freshest foods imaginable and massive displays. Nothing commercialized about shopping there. Mostly men were doing the shopping with cloth bags or baskets. I thoroughly enjoyed the experience even though we only walked away with a little cheese, some olives, a dried sausage and fresh strawberries, and the unforgettable baguette. There was a little bar in the middle of the Hall where several men were drinking wine and talking so we pulled up a couple of chairs to a large wine barrel converted into a table. We sipped Rose wine like the locals and enjoyed watching the French folks doing their shopping. No one was speaking English and it was fun not understanding their words but still being able to understand pretty much what they were talking about just by their body language. After the respite, we headed on to find a taxi for the last leg of our trip before we boarded the boat. We read that you have to call for a taxi since they are not just waiting around busy areas. We walked to where a taxi company address was listed to be and found nothing - no office, no taxis, nothing. Perplexed, we went into a bakery and asked the girl behind the counter if she knew where we could get a taxi but she didn't speak English. Another customer came into the shop and thankfully interpreted for us. But she still didn't know! We did a little internet searching and found the phone number which we called, only to find out that they didn't speak English either. By this point, we were finding our situation a little comical but we figured out that we could get the shop girl to talk to the taxi and have him come to her shop. It worked and a few minutes later he drove up to tell us he had to pick up someone ten minutes away. It gave us time to buy a croissant from the baker and hang out on the curb watching little cars buzz by on the cobble streets. 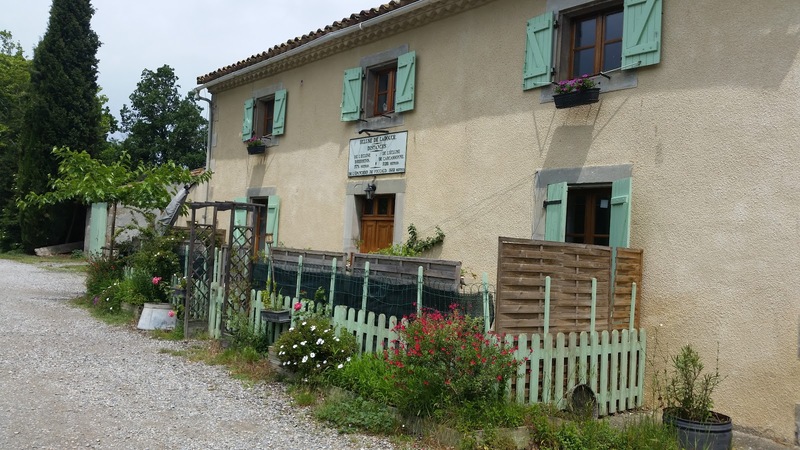 Le Somail was a tiny little intersection with a cluster of beautiful old stone buildings along the edges of the Canal du Midi. Since we were a little early to pick up our boat, we stopped in a cafe' with outdoor tables and ordered one of their handmade pizzas and wine of course! Little children were all dressed up and running around while their parents ate and drank wine with their friends. The atmosphere was quite relaxing. Eric piloting from the top of our boat. Our boat was ready on time and we stepped aboard after sighing all the paperwork. The next stage of our journey was about to begin! We dropped off the couple of bags we brought in the boat and filled out the final paperwork in the rental office. There was a real sense of festiveness as a small band was playing outside. Eric assumed the position of captain and once papers were in hand, he started up the diesel engine and pulled our little boat out into the canal. Fantastic hardly describes the fun of it. 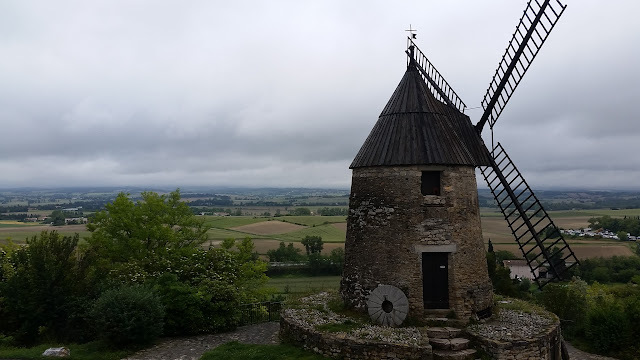 We had fresh bread, cheese and some strawberries from the market in Narbonne in our refrigerator, a snugly bed down below, our own bathroom with a shower and a 360 degree view from our dining room table. 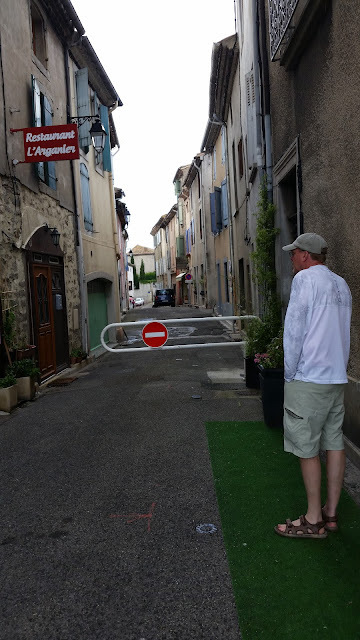 The air was fresh and only around 65 degrees out and we were in France! The canal was rather narrow in spots, so narrow that sometimes we had to almost come to a stop to let another boat pass. Everyone was quick to wave and call out greetings to us. 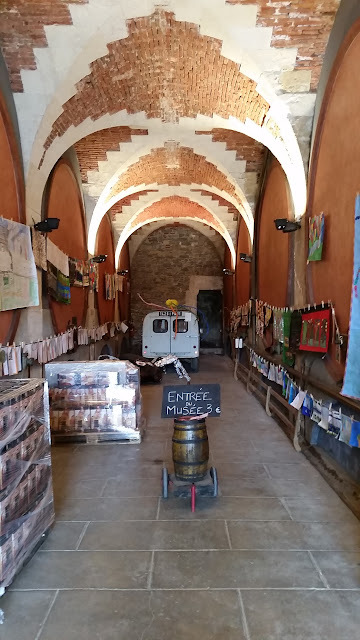 Our first little town was right along the canal and a winery with a huge barn from the 1500's was selling wine by the gallon jugs (actually 4.5 liters) and with the advice from previous travels we stocked up with three jugs that ended up lasting us the whole week. 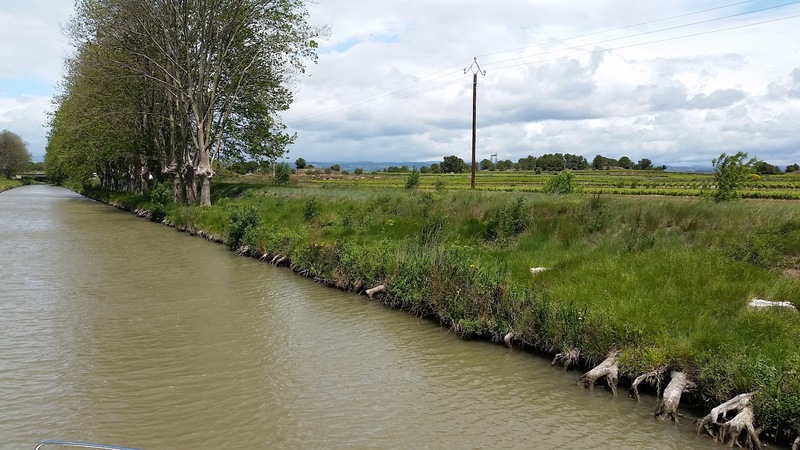 After that we boated on for a couple of hours just soaking in the bucolic French countryside. Our first lock was a little nerve wracking as we had only two sets of hands to work the boat and the ropes. We would wait for a signal from the lock keeper to enter the lock and then proceeded with caution. Once inside we had to pick a position along the towering rock walls, toss a couple of ropes up to the top where either I was waiting or another helpful traveler, secure them tightly and wait until any other boats joined us. 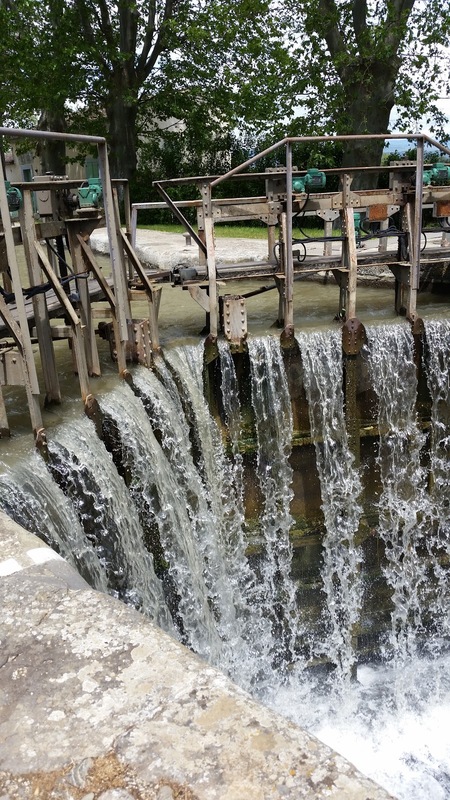 The lock keeper would then release the water gates and fill the lock. Water rushed in, tossing the boat like a cork, then slowed as it leveled with the top level of the canal, the gates opened and we boated on. Somehow we never understood that we had to do 54 locks over the time of our week of meandering up the canal. Our advice for anyone doing this would be to start at the top and travel south on the canal. But we had a blast. 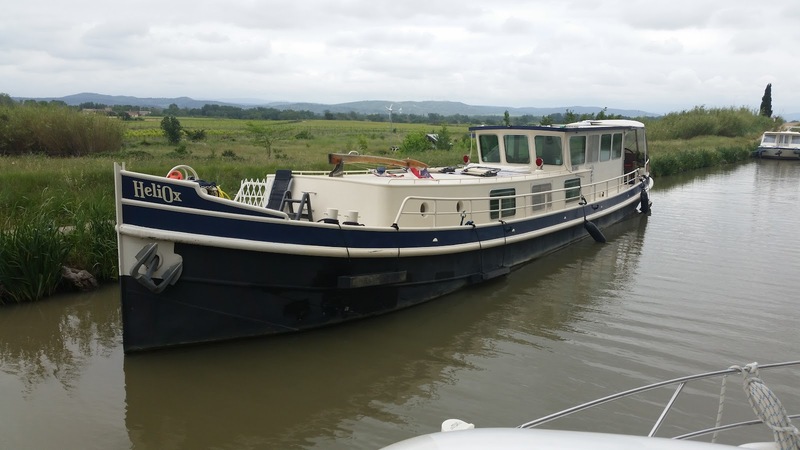 We saw many amazing canal boats that folks lived on either year around or at least for months. 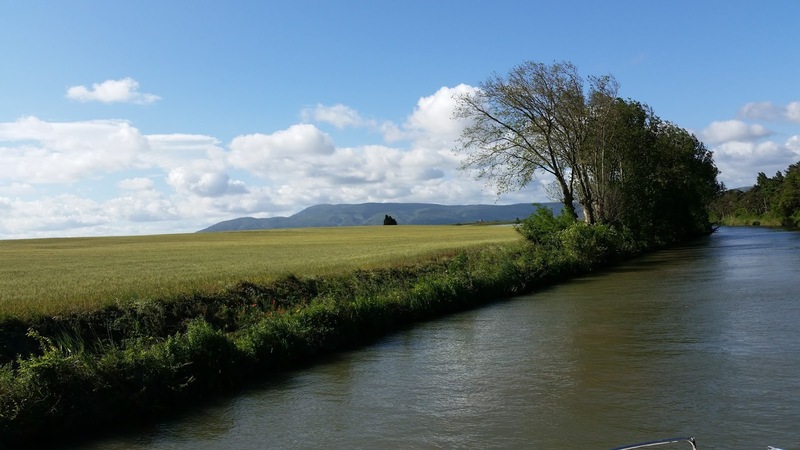 We could pull over at any point along the canal and drive a stake into the ground and tie off the boat so we could explore the countryside. Old ruins scattered the countryside and our canal actually went over streams. Our first lunch was so fun sitting in our little dining room. One of our lunch spreads on our boat. Our mapbook was critical for learning about the little towns along the way. Also, we had perfect mobile service for our T-mobile cell phones even though we were way out in the country. One thing we did notice almost immediately in our interactions with the French people is that they did not speak English, or at least very little as in one or two words or expressions. We learned to use gestures and expressions and eat whatever they served us! Along the canal were old, very old plane trees that looked like our sycamores. Many of the were cut down to stop the spread of a blight and a huge project is underway to replant the trees for miles along the canal. You can still see the remains of old roots hanging over the water like wooden fingers. We enjoyed finding little cafes along the way where people treated us like we were their guests in their homes and served us wonderfully fresh food. There was a notable lack of commercial products or labeled foods. Even wine was served in carafes not wine bottles and sometime for free. 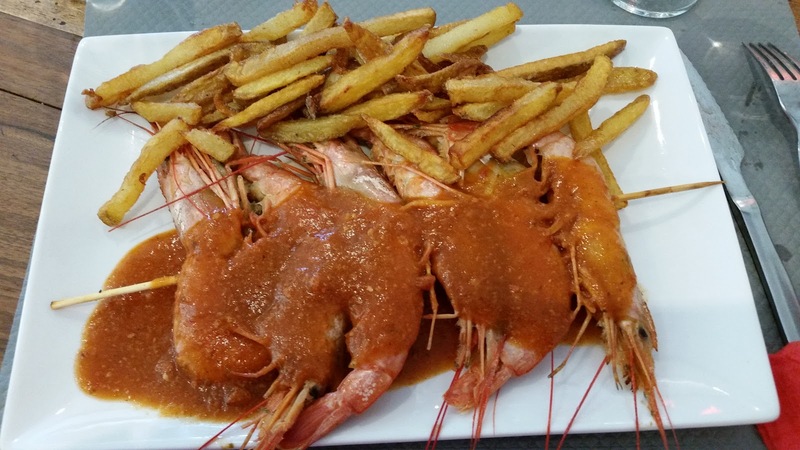 The food was always fresh and creative yet simple and delicious. The French are very practical at least where we traveled. Flowers grew everywhere as well as flowers, vegetables and fruits. Tiny little vineyards took up little corners of yards but there was very little lawn. I guess they valued their land too much. 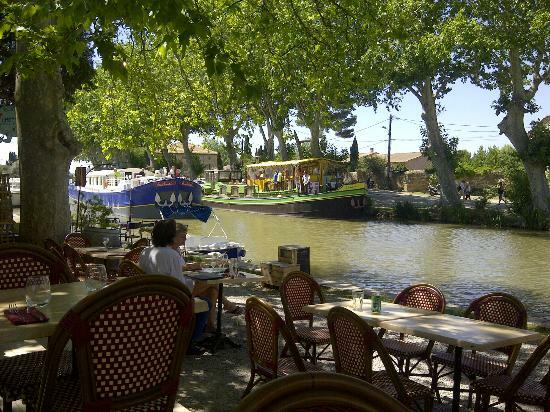 Sitting in a little cafe along the canal. We enjoyed traveling by day and stopping in at the little towns for lunch and to look around their shops. I was not used to seeing buildings that were 500 years old or more and still in use by small businesses, not museums. 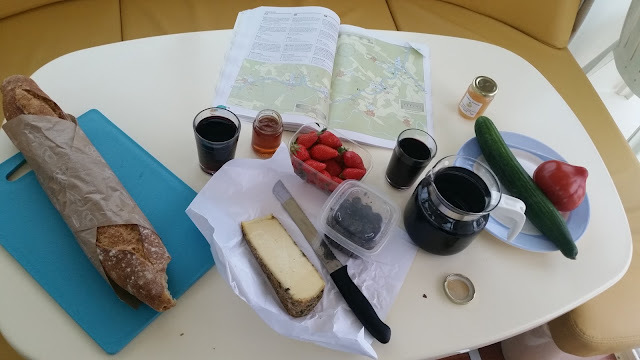 We heeded the advice of other travelers and made sure we always had bread and cheese and a little fruit or vegetables on board because restaurants were never guaranteed to be open for dinner. That way, we could enjoy exploring by day and still have a nice dinner at night. The weather was wonderful. At least that is how we chose to view it. 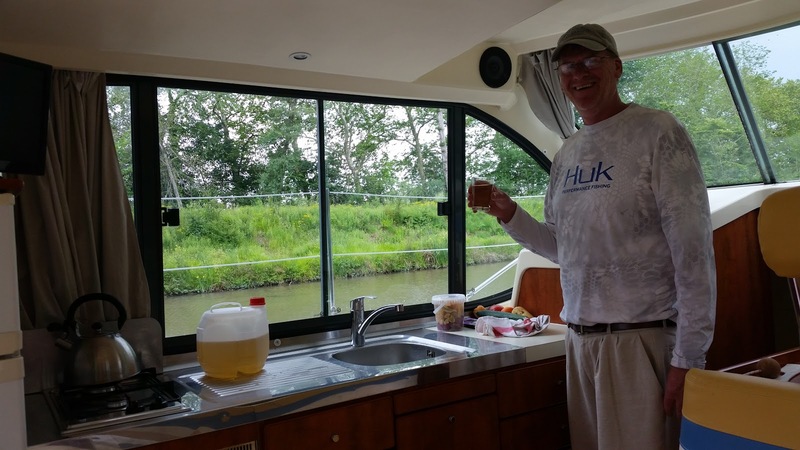 We had rain for several days and got thoroughly soaked which was chilly in 65 degrees but we had heat in our boat and could always warm up between working the locks. We did rent bikes for the week but found that we didn't use them as walking was easier and most of the villages were right along the canal. 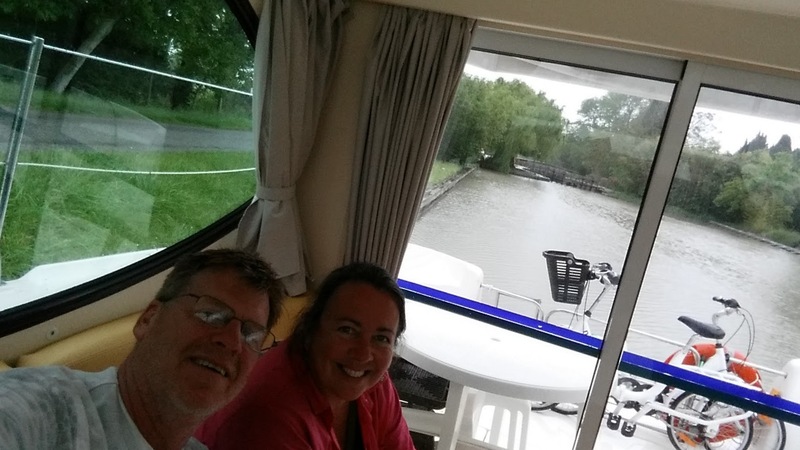 Our trip along the canal was both relaxing and hard work. We did see older citizens on boats like ours and hoped they were able to make the journey as the locks did take a certain amount of physical strength. The views from the canal were constantly inspiring us. 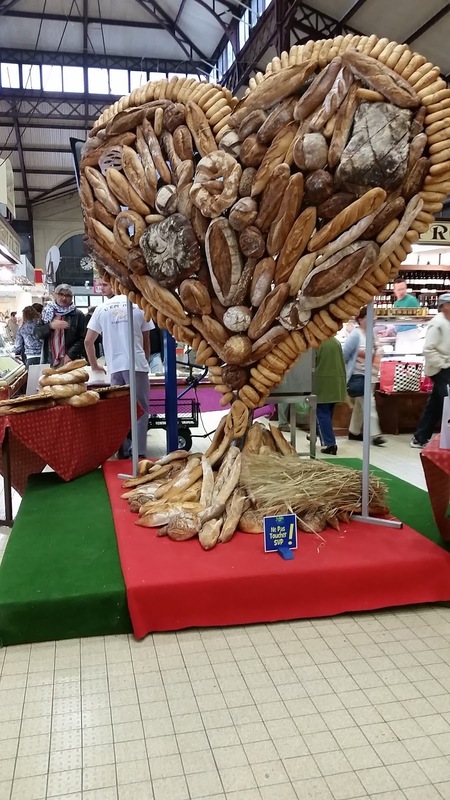 I can understand why the French people love their land. What an awesome way to travel! We spent a day in the town of Castelnaudary. The steep little cobblestone streets that ran through centuries old buildings up to the top of town where you could look out and see all the little neighborhoods as far as the horizon reached. We tried their famous cassoulet in a tiny little restaurant where the cook was happy to talk to us about his travels to Chicago. Fun times and great memories! History here is far different that the history of the United States! I won't take the time to mention all the little towns we visited but suffice it to say, each has their own character and is beautiful. By the time we finished all the 54 locks and made our way into the base station, we felt like we had been comfortably immersed in the gentle and generous nature of the French people of southern France. This was an experience that we would highly recommend. Even if you don't feel up to captaining your own boat, there are plenty of companies that offer full service cruises. 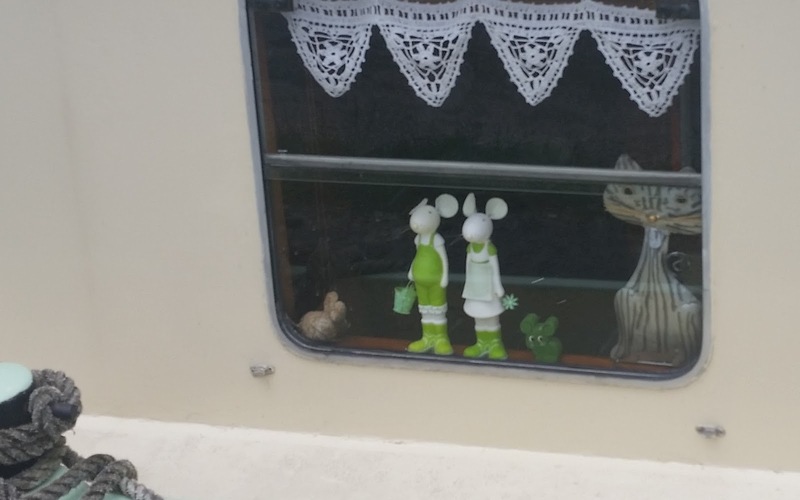 Fun decorations grace the canal boats.